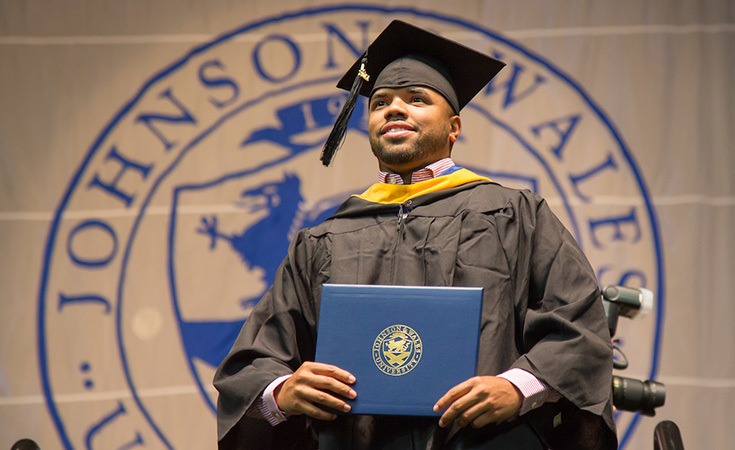 Providence, R.I. – April 18, 2018 – Nine luminaries representing a range of industry and academia will receive honorary degrees when the 2018 Commencement Ceremonies are held at the four Johnson & Wales University (JWU) campuses nationwide. GRADUATE STUDIES CEREMONY – FRI., MAY 18, 2018 – 11 A.M.
UNDERGRADUATE CEREMONY MORNING – SAT., MAY 19, 2018 – 8:45 A.M.
UNDERGRADUATE CEREMONY AFTERNOON – SAT., MAY 19, 2018 – 1:45 P.M.
Marie A. Sastre, president and chief operating officer, Signature Flight, will receive an honorary Doctor of Business Administration, keynote speaker. Marco Antonio Abarca, president and owner, Ready Foods Inc., will receive an honorary Doctor of Business Administration, keynote speaker. Dennis L. Thompson, founder and co-chairman of the board, Firebirds International LLC, principal, Red Mountain Management LLC, will receive an honorary Doctor of Business Administration, keynote speaker. Overall, the university will award a total of 3,200 degrees. Media contact: Miriam Weinstein, director of communications & media relations, 401-598-1157, miriam.weinstein@jwu.edu.